Finally we’re seeing a little sun of late, which for me is a reminder that summer is, maybe on its way and new sunscreen needs to go on the shopping list. Whenever I’ve asked beauty experts – be they dermatologists, make up artists or cosmetic surgeons – for their pick when it comes to anti-aging skincare, they all agree that the most important thing you can do to keep your skin looking good well into old age is wear a sunscreen. Daily. No arguments, no forgetting on a cloudy day, no saying, “my olive complexion is a sunblock in itself”! Most last twelve months max after being opened too, so if you’re still got some sitting around in your beach bag from this time last year then chuck it - ASAP! One formula that was a winner from the get go is Osmosis Shade SPF 30 Sunscreen/Moisturiser. Designed for daily use, it is a broad-spectrum physical sunscreen that protects against the damaging effects of both UVA and UVB rays whilst providing great hydration. All natural, it works by utilizing micronized and coated zinc oxide and titanium oxide, making it a safe sunscreen option that provides transparent coverage while ensuring that your UV protection remains harmless and non-toxic. The high-performance, luxurious sunscreen-meets-moisturiser is ideal for all skin types and can be applied under makeup or after a shave, and has a vanilla, grapefruit and coconut scent that brings the tropics inside even on a cloudy day. Neutrogena’s Beach Defence range is the newest from the dermatologist recommended suncare brand. With SPF 50 it is high enough to really make a difference, and works to combat the effect of prolonged exposure to water and the sun, both of which affect the permeability of the skin’s barrier and make us more susceptible to UV rays. It’s formulated with the brand’s famous Helioplex Technology - which harnesses the power of two sunscreens, Azovenzone and Oxybenxzone - so forms a broad spectrum UVA and UVB protective barrier that has been clinically proven time and time again to help skin defend against summer elements. It not only protects skin against photodamage (yes! ), premature aging (double yes! ), and sunburn (essential); but even reduces the amount of free radicals released into the skin - amazing. Last up is my most used brand from last summer - COOLA. A beautifully packaged collection of organic sun essentials produced out of Southern California, the COOLA range includes a plethora of yummy products that are high performance yet delicate and kind on the environment. It is produced in limited quantity batches in California (where the company is based), meaning that the range can be reformulated often, taking advantage of new developments in sun science and labelling regulations almost as they happen. 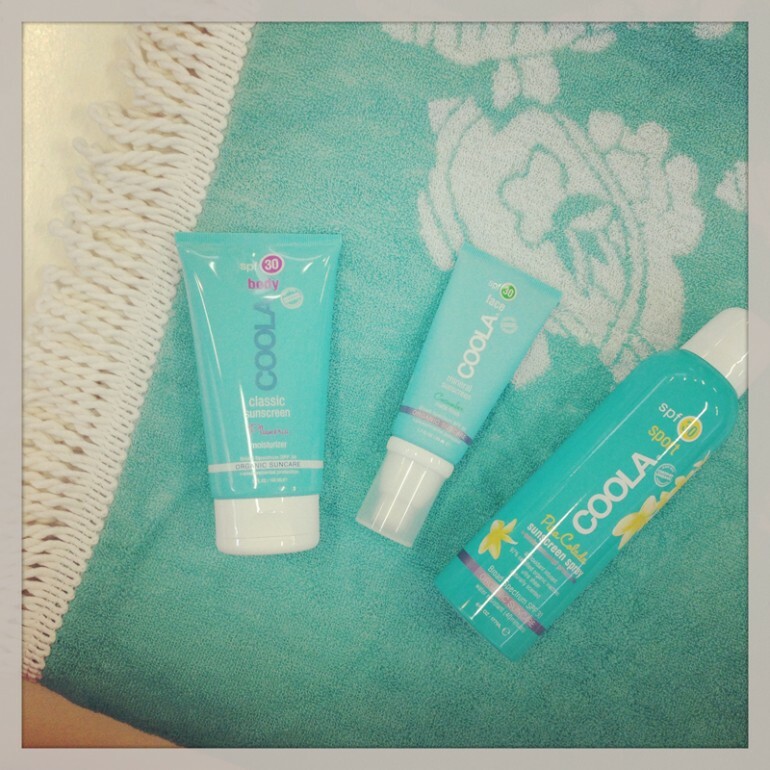 The COOLA range has three distinct organic sunscreen collections to choose from: Plant UV, Mineral, and Classic, each based on different active ingredients. The Classic Sunscreens use organic active ingredients (commonly referred to as “chemicals”), while the Mineral Sunscreens use mineral (“physical”) active ingredients like Titanium Dioxide and Zinc Oxide to scatter and reflect UVA/UVB rays. The mineral sunscreens are effective right after application, whilst the Plant UV collection protects the skin with naturally protective plant cells that contain antioxidant and anti-inflammatory properties. Get slapping some on now! My parents and cousin's alternate hosting Christmas each year, and this year we are heading out to my cousin's place for Christmas lunch. It's generally a pretty low key affair, with BBQ, salads, and plenty of dessert. With any luck the sun will be out so we can spend our lazy afternoon basking in the sunshine. Had to be when my cousin spiked the Tiramisu just a little bit too much. Every single bite was drenched in Brandy! My family background is Greek, so the food we eat on Christmas day tends to deviate from the traditional Kiwi fare. 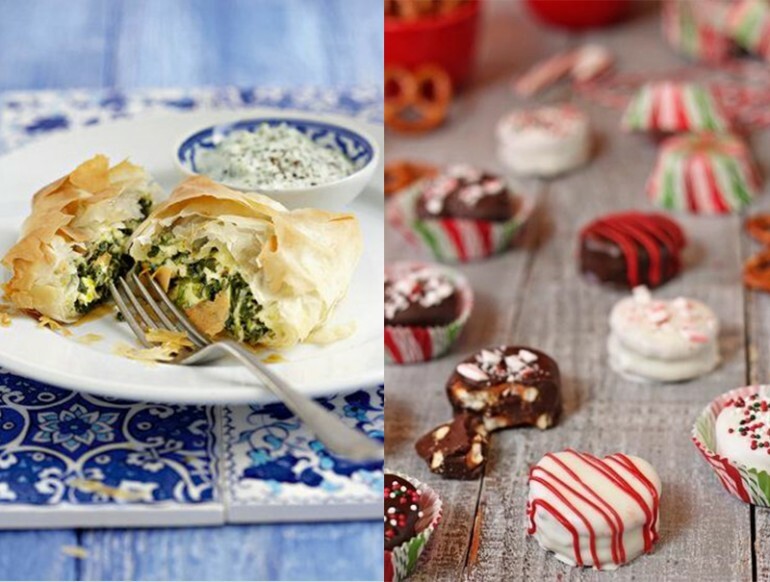 Growing up, my favourite food on Christmas day was always spanakopita, with layers and layers of home made buttery pastry encasing a flavoursome spinach, feta and rice mixture made by my Yiaya. Not only does it taste good, but it always invokes happy memories from when I was younger and would insist on helping her make it! RUBY Goodnight PJ's - Masquerading as a two-piece yet not a fully fledged 'onesie', I just love the Goodnight PJ's and am already having daydreams about how perfect it would be to wake up in them on Christmas morning. Liam Bright Shorts - I've spent the past two months searching for some denim shorts for the summer, and after recently trying these on, I'm pretty sure they're it. The cut is flattering and the linen is ideal for those balmy summer nights, which we're bound to have over the Christmas break. Lonely Cyd underwire Midline Bra & matching lace briefs - I've long wanted to purchase some of Lonely's delicate lingerie, although found that the soft-cupped, wireless styles offered me little support. Upon hearing that the Lonely team had introduced an underwire range, felt somewhat revolutionary, and the Cyd underwire lace bra, and matching briefs have since been nestled at the top of my wishlist. Grown Alchemist Hand Cream - I've been going through a 'Grown' phase lately, and just love the vanilla orange scent of their hand cream. MYDEERFOX black leather Tote - I'm not really in need of a new leather tote, but if I was, this would be it. RUBY Miles Mini Dress - I'm a francophile by nature, and of the thinking that when it comes to stripes, more is more. This dress is such a sweet smock style (comes in handy when over-indulging during the festive season) and universally flattering - every girl I've seen try it on looks smokin'. RUBY Ingenue Heels - A girl can never have too many pairs of shoes! I already have the RUBY Kingsley Bow flats, but the Ingenue bow heels are faultless for the Christmas party season, in mint or black. Liam Shundar Dancing Top - I just love the beautiful sheer silk jacquard fabric of the Shundar Dancing Top and the small bells adorned to the ties at the back of the blouse. This is my first wreath I've made and it was so fun and easy to make. I have already proudly hang it on the front deck! 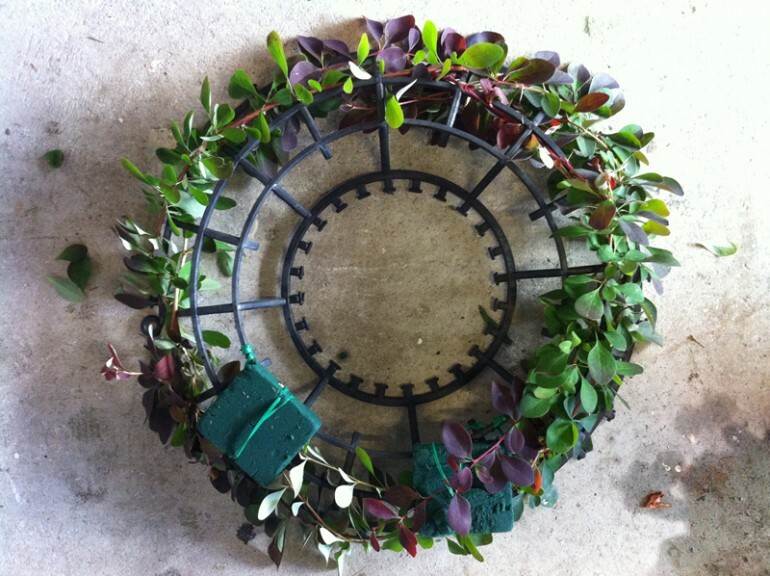 A couple of items you will need to grab before you start creating your Christmas wreath are florist wire or fishing wire, Oasis and a Wreath frame. You can build your own frame using a thick florist wire but for first timers using a frame gives you a solid base to work from which makes it a lot easier and quicker. Soak your oasis in water over night. 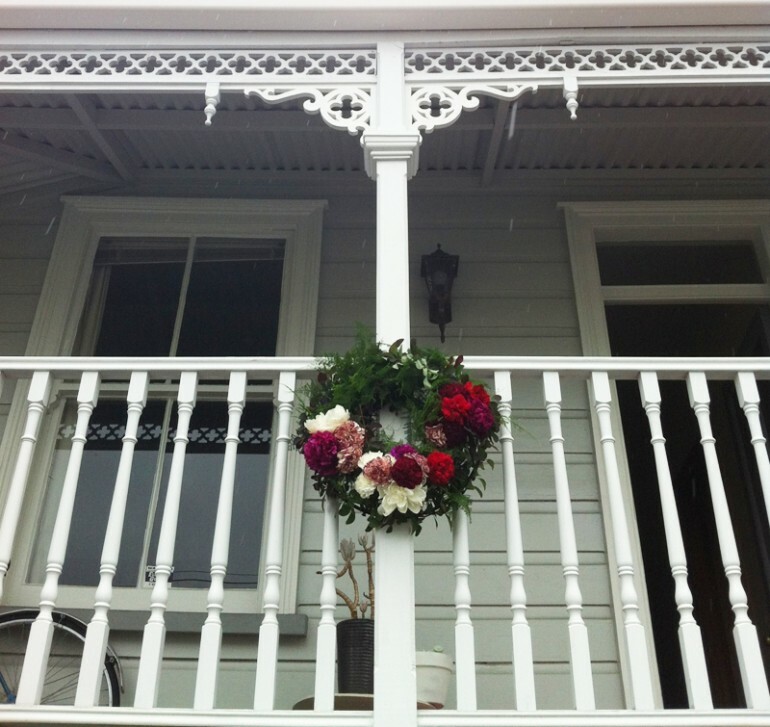 Once it has soaked right through you can collect your greenery + flowers. 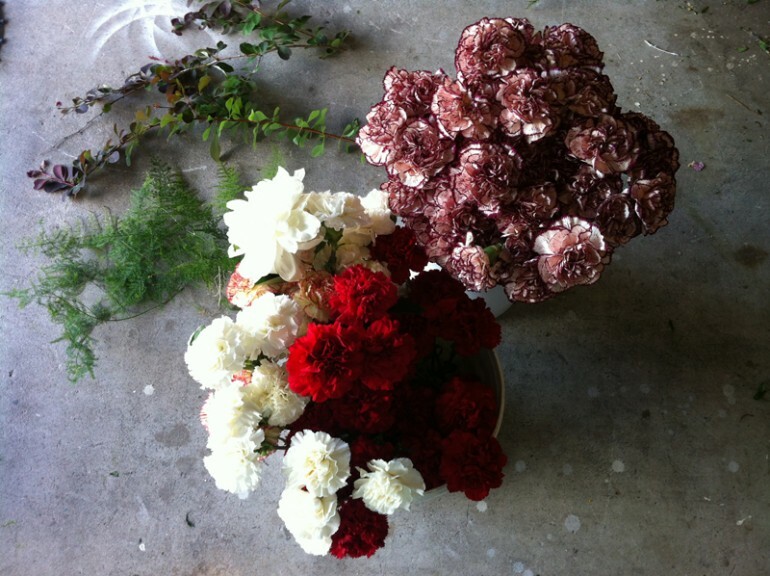 I picked some ivy and a fluffy green fern to mix in with my carnations and peonies. Weave your greenery in and around your frame so you start to cover it up. While doing this, start to think where you would like your flowers to sit in your wreath, you can add as many or as few as you like. 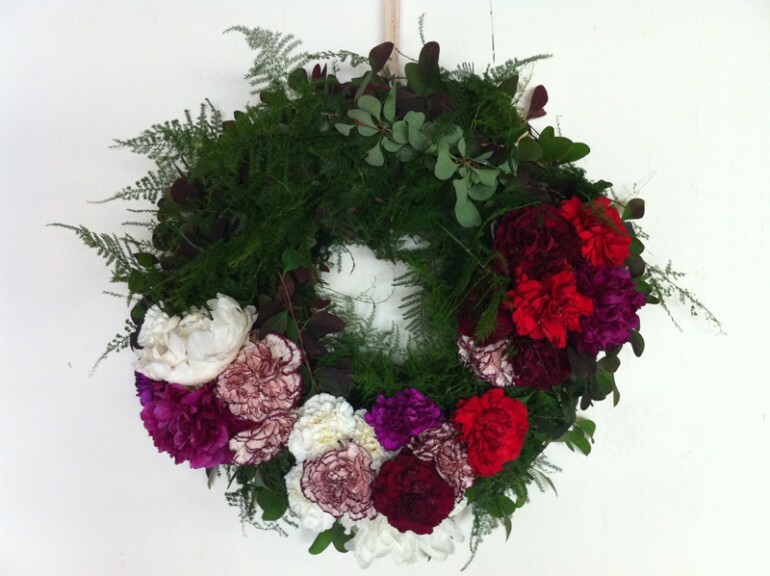 Cut the wet oasis into small squares and sit them where you want the flowers to be on your wreath. 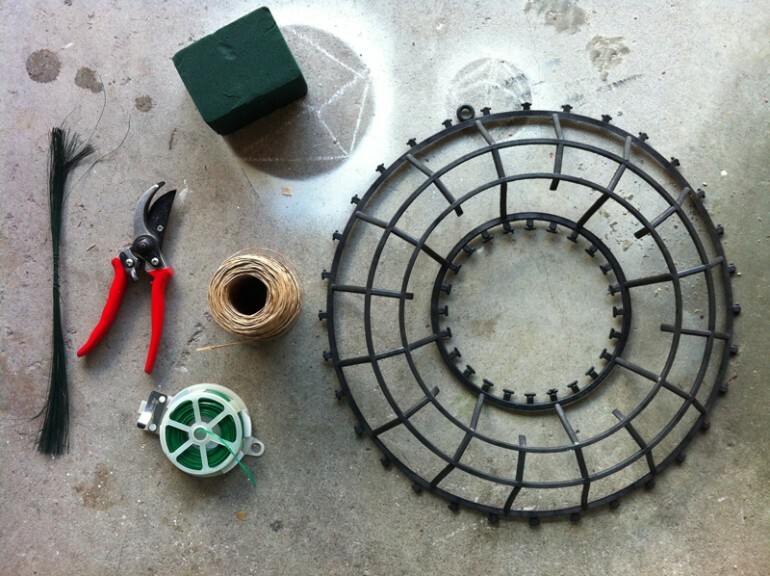 Attach the oasis to the frame using wire or string. Trim your flower stems to about 2cm and begin placing them into the oasis. The oasis will help your flowers live longer - pour a cup of water on the oasis every day so it doesn't dry up! Keep adding more greenery and flowers till you cant see the frame! Make it as wild or as simple as you want it to be.